How many small non profit organizations are in cities like Chicago, doing wonderful things to help youth and families, but struggling to find consistent funding, new volunteers, and public attention to support their good work? How many have a web site, but not much traffic? In the retail business world, that's like having a great store, with fantastic products or services, but no customers, because no one knows you exist. Most businesses overcome this by buying advertising exposure, or hiring public relations firms to generate public attention. Most small non profits barley have money for rent and service, with few dollars for consistent advertising. Thus we need different strategies. One is to use blogs to tell your story. I've been hosting a blog since 2005, as my own way of sharing my ideas and attracting public attention to Cabrini Connections, the Tutor/Mentor Leadership and Networking Conference and to other tutor/mentor programs in Chicago. I encourage volunteers and other staff at Cabrini Connections to also use blogs to tell of our work from their different job perspectives, attracting visitors from their different college and family networks. I've participated with the Non-Profit Blog exchange for the past couple of years because it expands the network of bloggers who I learn from, and who work with me during certain time frames to increase attention for all of us, not just one of us. This month I'm exchanging blog messages with the Brandywine Counseling Blog. They are Delaware's largest non-profit addiction treatment agency. I think the way they use their blog to introduce the people in their organization is a powerful form of story telling. If you are a leader of a volunteer-based tutor/mentor program, in Chicago, or in any other part of the world, I encourage you to review the way this blog personalizes their organization and uses the blog to share daily information, attract donors, and build understanding of what they do. I also encourage you to look at blogs like this which demonstrates a powerful use of visualization to help draw people together around common goals. On the left in the links section I have tags to previous articles I've written on strategy, and to articles I've written using geographic maps, and concept maps. I also have links to sections on the Tutor/Mentor Connection web site where I aggregate links to blogs that talk about tutoring/mentoring, or some of the issues we're dealing with. In the Presidential campaign to elect a new US president, we're hearing a lot about change, and many uses of the word GOD. We are hearing people say that in America, anyone should be able to reach his or her dreams, if they just work hard enough. Maybe this means, GOD helps those who help themselves. If you lead a small non profit, a blog is a free, low-cost way to help yourself get attention from those who need to help you reach your dreams. If you're already incorporating a blog strategy, please share it. If you are working with volunteers in tutoring and/or mentoring programs, I hope you'll link to us in your blogs, and add your link to our library of blogs. Good luck to all of you as you move into the 2008-09 school year. If we believe that youth would benefit from more adult support and extended learning opportunities, how do we make sure comprehensive tutor/mentor programs are available in all of the places where they are most needed? I held various retail advertising roles in the Montgomery Ward corporation from 1973 to 1990 and learned how the company supported over 400 stores in 40 states with a centralized merchandising, advertising and store support strategy. I've applied this thinking to the strategy of the Tutor/Mentor Connection, which is outlined in this pdf. If you are a retail executive, I encourage you to help other business leaders understand this strategy, through your own perspective and business experience. If business takes the lead in supporting the growth of non-school learning centers, it can influence the thinking and problem solving skills they want youth to bring to the workforce, and they can influence the aspirations kids bring to school with them every day. One of my mentors is Merri Dee, who is retiring from WGN TV after a long career. When we first met in 1993 she said "If it is to be, it is up to me." I've used that as one of my motivating slogans ever since. If we want the type of country that our presidential candidates are both promising, we need leaders from every sector who take ownership of these goals. I watched Michelle Obama's speech last night, and was really energized by her presentation and her message. If you work hard, get a good education, you have a chance for the American Dream. "America should be a place where you can make it if you try," she said. Since I try to deliver that message every day to my own two kids, and to the 7th to 12th grade teens of the Cabrini Connections tutor/mentor program in Chicago, I really appreciate this message, and the thought that it might be consistently modeled for the next 8 years by the top leaders of our country. However, there was another inspiring message waiting for me in today's Chicago SunTimes. I read the Rev. Jesse Jackson's column, with the headline that read "Obama can inspire but we must lead." "Real change only comes as ordinary people are inspired to act in extraordinary ways." As you listen to the campaign speeches and decide which candidate to vote for, I urge you to consider with person, at the national, state or local level, inspires you most to leave your own comfort zone, or your own personal problems, to do something to help someone else, or to help make this a "world as it should be". I encourage you to visit http://www.cabriniconnections.net and http://www.tutormentorconnection.org to see how ordinary people have been working to help make the world a better place. I hope you are inspired to help us. With the national conventions taking place over the next two weeks, millions of people will be focused on the process of electing our next President. However, I found one leader who is focused beyond this, of mobilizing faith communities to "make a difference" where ever they are in the world. This leader is Rick Warren, who is a mega church leader and hosted a live interview with Obama and McCain, just a couple of weeks ago. I visited Warren's web site and the headline on the page is "The Church – the greatest force on Earth'. I followed the links, to another web site titled "the P.E.A.C.E. plan" which outlines a strategy for engagement of faith communities in places throughout the world where people need help. I posted an introduction to Rick Warren on these web sites, and if you're reading this and have a connection, I encourage you to forward this introduction to him, or to leaders of your own congregation. I have focused some of my blog articles on actions faith leaders can take to help volunteer-based tutor/mentor programs grow in high poverty neighborhoods of Chicago and other cities. I've used maps and concept maps to illustrate ways leaders can use these tools to support the distribution of comprehensive, long-term programs, in more of the places where they are needed. In this world of more than 6 billion people, I'm just a grain of sand in the ocean of life. 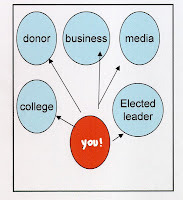 However, I use this and other Tutor/Mentor Connection web sites as a resource that people with much greater visibility can use to further their own leadership goals. While the candidates are outlining the reasons people should vote for them in November, I hope they and others will be pointing to maps, that outline a strategy, and that point to places where members of faith and secular communities can serve as volunteers, leaders and donors to help youth living in poverty get the adult learning supports they need to have greater success in school and in life. That can happen if you pass this message on. A School boycott, or not? You can search Google for “school boycott Chicago” and find 10 articles on the first page talking about how ministers in Chicago are urging a boycott in order to change the funding formula for how Illinois funds public schools. This makes great news, but does it make sense? It certainly is important. This map shows that there are a lot more poorly performing schools in low income areas of the city, than in other areas. But what do we get from a boycott? For instance, if the per student spending for Chicago kids were $1,000 higher, what would we get as a result? Would that change the poverty surrounding a school? Would it expand the range work and career opportunities modeled by parents and community members in high poverty neighborhoods. Would it expand the number of businesses with volunteer and philanthropy strategies tied to workforce development goals? Would it expand the number of volunteer-based tutor/mentor programs, with technology, arts and college and career support, such as offered by Cabrini Connections to teens in the Cabrini Green area? Do we really believe that if several thousand CPS students sit in the lobby at New Trier or in downtown businesses for a few days will change the priorities of members of the state legislature who live in the suburbs, or in downstate Illinois? How many votes are needed to change the funding formula anyway? Is there a strategy to increase the number of people who might vote for such a policy change, because they have become personally involved with kids in these neighborhoods? What I do know is that school starts in a couple of weeks and kids living in high poverty areas, or near poorly performing schools would befit by being part of a comprehensive, volunteer-based tutor/mentor program. What I do know is that these programs are all recruiting volunteers right now, and most of them are also looking for donors, to cover the increasing expenses of operating a program, or the short fall in funding from other sources caused by the poor economy or the donor attention on the national elections or their own personal health and family issues. I also know that as a result of becoming a volunteer at Cabrini Connections many years ago, I and several other former volunteers now are leading tutor/mentor programs, or helping to raise money for them. If there were more programs like this throughout the city, perhaps this would increase the number of volunteers who take on such leadership roles, and who help change public policy, while also working to increase private funding for extra learning and mentoring initiatives throughout the city. With the media writing about the boycott, the conventions, the Olympics, how do the leaders of these neighborhood tutor/mentor programs find new volunteers, or donors to help pay the bills? You are the answer. Think of yourself as the red dot in this graphic. 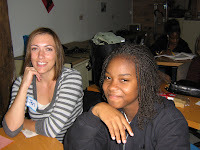 If you email five or ten people in your network, and encourage them to look at this Volunteer Recruitment Video, or read articles on this blog and look for ways to be a volunteer or a donor in a Chicago tutor/mentor program, you will be helping to build a bridge between those who live in affluent areas and have the resources to help, and kids in poor neighborhoods, who need good schools, and great networks, but cannot get these without your help. Don’t wait and expect someone else to take this role. While you’re reading about the boycott, build your list and send out an invitation to support one or more of the tutor/mentor programs that you can review in the Chicago Program Links section of our web site. Check back tomorrow and I’ll post an article about how churches in the suburbs can help neighborhoods in the city, or in poverty areas of the suburbs. Read about the Volunteer Recruitment Social being held at ING Direct Cafe, 21 E. Chestnut, in Chicago. Cabrini Connections, Working in the Schools, Chicago Lights at Fourth Presbyterian Church, Cabrini Green Tutoring, and East Village Youth Program, will all be represented and recruiting volunteers. If you can't attend, visit the web sites of Chicago programs and shop for a place to volunteer time, talent or money to help kids in Chicago. I searched Google today to see if any results were found using the word "blogevangelism". I found 78 listings. Thus, am I part of a new trend? Read a couple of useful posts using this term, here and here. I'm not sure that these folks are using the term the way I am, to create attention for a social cause. I first used this term today, in a post on the T/MC forum, where I encouraged others to borrow from ideas that I and others post on T/MC blogs, to create their own outreach and "blog-evangelism" that reaches people in their own networks. 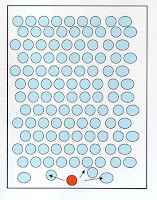 Thus, if you look at the graphic, imagine yourself as the red ball on the world's largest Ping Pong table. Every time you write about tutoring/mentoring, and point to a T/MC blog, you are encouraging the people you know to spread the message you are writing about. If they pass this message on via their own blogs and networking, it can quickly reach around the world. If you network strategically, talking about things that other people are thinking about, such as volunteer recruitment during the "back-to-school time frame", then your blog can become fuel that propels this movement forward, resulting in more people become involved in volunteer-based tutoring/mentoring and other activities that help kids move from poverty to jobs and careers. The aim of the Tutor/Mentor Connection has always been to create better information about tutoring and/or mentoring programs and where they are needed so that this information could be used by leaders from many sectors to help existing programs constantly improve, while filling voids in neighborhoods with too few. We use this information to organize volunteer recruitment events, such as the Coffeehouse Recruitment Social being held Thursday, Aug. 21 at ING DIRECT Cafe in Chicago. Read more here. Organizations who are listed in the Program Locator are asked to fill out a program profile (which you can see here) that provides information for our maps and contact information for potential volunteers. However, we've been doing a different survey, intended to help us understand the differences between programs, and the common issues most face. We've had 15 people complete the survey so far and 10 come from beyond the Chicago region. We'd like to have more people from Chicago provide this information, so ask that you take the survey if you're involved with a tutor/mentor program, or pass this on to other people. Those people who complete the entire survey by September 15, 2008 can be entered into a drawing to win a brand new Sony DCR-DVD405 digital camcorder!!! What can one person do today to make a difference? Did you get up this morning inspired to do something special? Did you read the paper, or watch the news, and feel overpowered, not able to have an impact on the big problems of Chicago, or the world? You don't need to feel this way. There is something you can do EVERYDAY that can help make this a better world. Use your Whuffie power. What's this? It's a description of the social network and reputation that people accumulate. I just learned about this term over the weekend at this post. We all have some Whuffie power. If we use it strategically, I think we can change the world. Or at least we can help a lot of the people who are trying to change the world get the resources they need every day to keep doing their work. Look at the graphic above. Everyone has people in their network who work in business, or are at universities, or in church. Some of these people have more power than others, and more ability to have an impact on a tutor/mentor program. You can connect the people in your network to information that they can use to become a volunteer, donor, advocate and/or leader of a volunteer-based tutor/mentor program in Chicago, or of other organizations that you can find as you browse the LINKS LIBRARY on our web site. You can connect them to strategic thinking concept maps, that they can incorporate into their own leadership. If you, and other people use blogs, email, phone calls, group meetings and other forms of communications to connect one person a day to this network, the number of people helping kids in this city will dramatically increase. Ultimately some of these people will have the wealth and Whuffie to have a quantum impact on the entire tutor/mentor movement, not just one or two programs. It's really simple. But it can change the world. Look in the mirror at the end of the day and keep score. Who did you connect to the Tutor/Mentor Connection today? Once you have a light bulb, you need an industry to distribute it. I've been participating in a Social Edge forum this week and one of the introductory articles was from the Harvard Review, titled Design Thinking. In this article the author wrote about how "Thomas Edison created the electric lightbulb and then wrapped an entire industry around it." He wrote, "Edison’s genius lay in his ability to conceive of a fully developed marketplace, not simply a discrete device. He was able to envision how people would want to use what he made, and he engineered toward that insight." I have used this example in the past (read here) to illustrate how the Tutor/Mentor Connection was created to provide a full range of supports needed by our Cabrini Connections program, so that we could have a greater impact on our 7th grade students reaching jobs and careers by age 25. In order to build support for a single small program in Chicago, we've had to envision an industry that would support similar programs in every poverty neighborhood of the world. In order for this vision to be successful, my role is a catalyst. Others need to become the owners and leaders. This concept of decentralized organization supported by a platform of knowledge and collaboration is illustrated in a book titled The Spider and the Starfish. I urge you to read it. I encourage you to view the concept maps and other articles we've created to illustrate this vision, and to invite our peers, and potential supporters, to incorporate these ideas into their own thinking. I hope you notice the new format for this blog. Instead of archiving articles by month, I've archived them by topic. Thus, if you want to review articles related to violence, or No Child Left Behind (NCLB), click on the tag, and you can scroll through past articles on this topic. If you're forming a learning group, these articles can provide a valuable resource for helping your group become a leader in building this Edison-like infrastructure. I hope you'll use it, and contribute to it with your own articles. 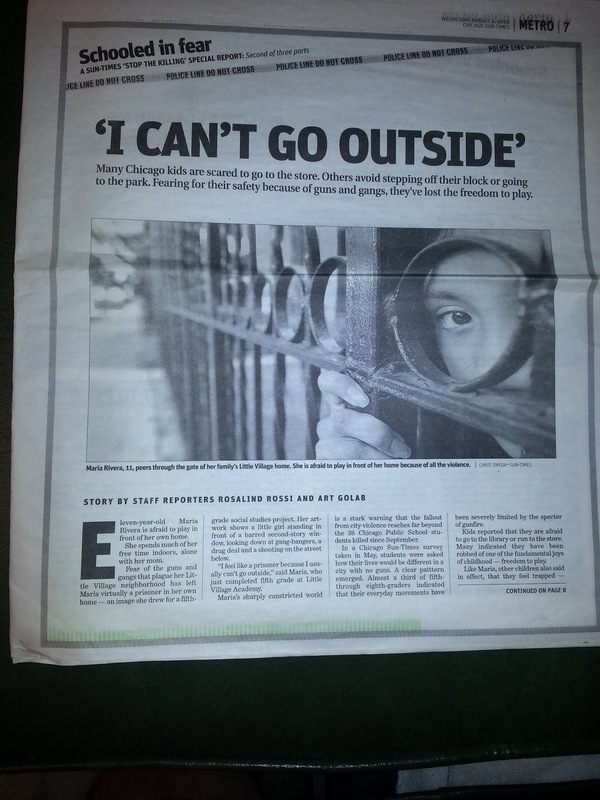 On August 5-7, 2008 the Chicago SunTimes devoted nearly 10 full pages to a Special Report, titled Schooled In Fear, which showed the impact of urban violence on the lives of inner-city children. Using drawings created by kids, reporters illustrated how inner city youth were exposed to constant fear of "getting shot". When asked "How many of you know a friend or relative who has been shot at?" the headline said "A sea of hands flew into the air." This series was illustrated with colorful photos and eye-catching headlines. It had to attract the attention of a large number of SunTimes readers. My hope is that many want to get involved, or respond to the children's request for more afterschool activities in their neighborhood, which was a request youth made during the final day of this special report. I first wrote about this a couple of days ago, with a headline of "They are being robbed of their childhood"
In that article I showed maps of universities and hospitals in Chicago, who could be strategically involved in supporting the growth of tutor/mentor programs. 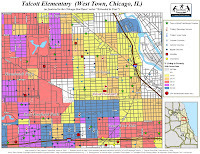 Since then the Tutor/Mentor Connection (T/MC) created three maps that we hope volunteers, donors and leaders will use to become strategically involved in helping more and better non-school learning, tutoring and/or mentoring programs become available to youth in these and other urban warfare neighborhoods of Chicago. This map shows 3 hospitals and several churches in the area, as well as the two expressways (I-290 and I-55) which go through the neighborhood on the North and the South. Thus, thousands of potential volunteers pass through this area every day. There are a few organizations in the 60623 zip code already offering various forms of tutoring and or mentoring, but more are needed. Use the zip code map to learn about organizations offering volunteer based tutoring and/or mentoring in the 60623 zip code. Sexton Elementary, 6020 S Langley Ave, Chicago, IL 60637. 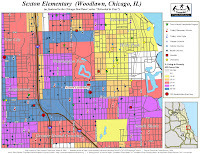 This map shows very few tutor/mentor programs near the school, yet the school is very close to Hyde Park and the University of Chicago and University of Chicago Hospital. A major expressway brings volunteers from jobs in the city to homes in the suburbs every day. If teams of students, faculty and alumni from the university begin to use their time, talent and dollars in a long-term strategy aimed at pulling youth through school and into the university, this neighborhood might be filled with the best tutor/mentor programs in the country, not just one of the best universities and hospitals. Use the Zip Code map to learn about the availability (if any) of tutor/mentor organizations in 60637, 60621 and 60619. Search the zip code map for 60622 and 60612 and you'll find a few organizations in this area offering volunteer-based tutoring/mentoring, although none are close enough to Talcott School for kids to walk to these sites. This area is the near West side of Chicago and has three major hospitals and major highway access routes that volunteers from the city or suburbs could take to be part of tutor/mentor programs in the area. What's needed is leadership from businesses, universities, media to encourage volunteers and donors to support existing programs, or to form learning and planning teams to help develop and sustain new programs in underserved areas. Every day there seems to be another act of violence in Chicago. A tutor/mentor program is not a short term fix. However, had leaders began to form tutor/mentor programs 15 years ago when the T/MC began its advocacy campaign, many neighborhoods might have a larger number of mature programs with kids going to college and jobs, rather than jail and funerals. In five, ten or fifteen years what will the landscape of tutor/mentor programs serving Chicago look like? What will the institutions who own real estate in these neighborhoods have done to help build and sustain such a network of programs? Anyone reading this message can invite leaders of the various organizations shown on one of these maps to come together to build a tutor/mentor connection strategy for each of these map areas. If you'd like to know more and have our support, join a discussion group, or use the resources on the T/MC web site to learn where, why, and how you might get involved. 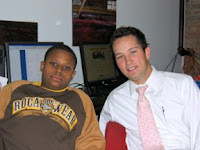 Each year since 1995 the Tutor/Mentor Connection has worked with Chicago Access TV to help recruit volunteers to be part of tutor/mentor programs throughout the city of Chicago. This year a slide show is running on TV27 during August, and it can also be seen as a volunteer recruitment video on blip.tv. If you're interested in volunteering, you can use the Chicago Tutor/Mentor Program Locator web site to shop for pick programs near where you live, or work, and who look like you'd want to join. As you consider ways to be involved, I encourage you to think of ways you can help Cabrini Connections, the Tutor/Mentor Connection and other volunteer-based tutoring/mentoring programs, get the operating dollars it takes to offer these services. 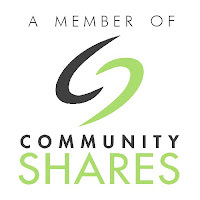 The T/MC is part of Community Shares of Illinois, which organizes workplace fund raising campaigns in businesses, schools, universities and government offices. Using payroll giving an employee can make a donation of $1 a week, which is less than the cost of a cup of coffee. Yet this adds up over a year to a $52 donation. If thousands of employees designate small weekly donations to tutor/mentor programs this can have a huge impact on our sustainability and effectiveness. As your employee if they offer a workplace campaign. Ask if Community Shares of Illinois is included, or if your company allows you to write in non profits of your choice. By doing so you help us support the volunteers who join our programs, and thus help us do more to help kids. "They are being robbed of their childhood"
Today the Chicago SunTimes concluded a three-day series titled "Schooled in Fear" with an article titled "They are being robbed of their childhood"
In today's article children were quotes as asking parents "to volunteer to lead after-school programs in drawing, painting, handcrafts, dancing, sports, cheerleading and chess." For such activities to take place in non-school hours, there need to be safe places where kids and volunteers can gather. Such places require structure, staffing, leadership, and someone to pay the bills. Let's use the Tutor/Mentor Connection's Program Locator and zip code map to see what's available to kids in these areas. Little Village Academy, is at 2620 S. Lawndale Ave, in the 60623 zip code. Looking at the zip code map you can see that the North part of this zip code has higher levels of poverty than the South part. Click on the 60623 zip code of the map, and you can see that there are 3 Boys and Girls Clubs in the area, plus the Better Boys Foundation. 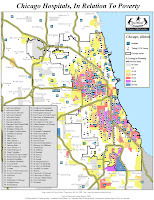 According to the 2000 Census there are 29,011 youth under 18 in the South Lawndale area. That's a lot of kids and too few programs. Talcott Elementary is at 1840 W. Ohio Street, 60622. Looking at the zip code map, and searching for tutor/mentor programs serving elementary or middle school students, we don't find any within walking distance for kids attending this school. Yet, if you look at the Google Map for this area, the neighborhood is surrounded by Chicago Ave, Grand Ave and Ashland Ave., meaning thousands of potential volunteers are driving past this neighborhood as the leave work every day. Sexton Elementary is located at 6020 S. Langley Ave, 60637. Looking at the zip code map and searching for tutor/mentor programs serving elementary or middle school students, we don't find any within walking distance for kids attending this school either. Yet we do see the University of Chicago just a few blocks away. I wrote an article recently quoting President Jimmy Carter, wondering why poor neighborhoods surround so many institutions of higher education. The Tutor/Mentor Connection has been adding new maps to its library for the past few weeks, including this map showing hospitals in Chicago. We've been writing about these maps here, here and here. If you search Google for the location of the three schools in the SunTimes article, you'll see exactly where these school are located in the city. If you compare this to the Tutor/Mentor Maps, you can see the degree of poverty and poorly performing schools in the area. You can also see locations of hospitals, businesses, churches and universities nearby, who might be a source of volunteers, leaders and donors to organize arts and technology enriched tutor/mentor programs. We also created maps showing locations of universities. On both of these maps you can see levels of poverty surrounding the University of Chicago, and University of Chicago Hospital. This has been there for a long time, so when I see TV ads saying the University of Chicago Hospitals rate number 1, I guess this does not mean they rate number one in helping reduce the impacts of poverty and violence, which are public health issues, in the neighborhoods surrounding the hospital. I'd say the same thing about the leaders of the University of Chicago. The editorial writers are demanding more accountability from educators. I'd like to see them ask leaders of universities and hospitals to be more involved in solving these problems. Programs where people can volunteer to do arts, crafts or be mentors and tutors don't just "start up". Good programs take a dedicated group of leaders, a consistent source of funding, and many years to grow from an idea to an impact. This means the institutions in the areas around where programs are needed need to make it part of their own strategic missions to build a network of good programs to serve as pipelines to careers for kids in these areas. It also means that we need to support the programs that are already operating in the city. Right now any business, church, hospital or media station can create an editorial or advertisement that says "Be a volunteer. Be a donor." You can point to the zip code map and Program Locator, to shop for what zip code you want to support, and what program(s) you want to give time, talent and dollars to. Do it now and you can help a few more kids have a non school support system this fall. Do this all year long and you can help new programs form where there are now voids. Don't do anything and we can look forward to reading another series by the SunTimes or Tribune every few weeks for the next decade. Mapping impact of violence on kids. Moving to solutions. 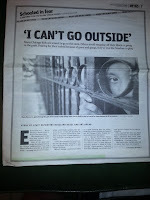 This week the Chicago SunTimes is hosting a series of feature articles to show the impact of violence on inner city kids. In April a story titled Hidden Wounds of Violence focused on the same issue. I wrote about it here . I included a quote from the article in which a parent said "she has enrolled him in tutoring, mentoring and other programs to give him an outlet for his energy in a safe, indoor environment." Mike Trakan, who works for the Tutor/Mentor Connection posted an article on his blog showing locations of poorly performing public schools, along with "succeeding schools" which may just be steps away from being on the poorly performing list. He overlayed this list on a poverty map, and then a demographics map, showing high concentrations of African American and Hispanic populations in the city. Mike's questioning some assumptions and asking for feedback, so I encourage you to read the article. 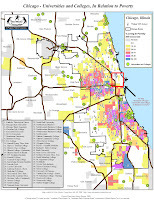 However, Mike's map and the articles in the SunTimes only talk about the problem. They don't talk about the availability of tutor/mentor programs, or lack thereof, or of ways businesses, congregations, media, and others could provide the manpower, dollars, technology and other resources to make comprehensive, volunteer-based tutor/mentor programs available. Here's some maps that illustrate the problem. This map shows the location of around 140 places where a combination of volunteer based tutoring/mentoring is offered. These programs vary greatly on size, quality and what age group they serve, but they are a starting point for any volunteer, donor, parent or community leader who wants to help kids have access to this type of support. You can see from the map that many neighborhoods have no programs. Thus, in addition to supporting existing programs, we need to be thinking of ways to start and sustain new programs, borrowing from the experience of those already in existence. This map shows tutor/mentor programs serving high school youth. If you compare the two maps, you see an even more critical problem. Not only are there too few tutor/mentor programs in total, but there are even fewer offering positive opportunities and mentor connections to high school youth. We cannot compete with gangs if we don't offer programs and services in the same areas where the gangs are recruiting. Thus, as you read the articles in the SunTimes, get together groups within your church, company, alumni network, or civic/social group and talk about ways your group can mobilize volunteers to give time, talent and dollars to support the growth of tutor/mentor programs throughout the city, or in a single neighborhood. Use the web sites of existing programs to shop and compare and to make your choices. Use the Program Locator Zip Code map to learn what organizations operate in what zip code and to find contact information and web addresses. Don't wait for someone else to organize such a group. At the end of the day, look in the mirror and give yourself a bit of praise for what YOU do to make this happen. Connecting Tutor/Mentor Networks. Making a Bigger Impact. As we enter the month of August, volunteer-based tutor/mentor programs in Chicago and other cities will be trying to gain public attention that helps recruit volunteers and donors so that as school starts more inner-city kids have the hope and opportunity that well organized tutor/mentor programs can provide. However, we're competing against the National Election, the Olympics, local sports teams, and negative news coverage of the violence that is destroying hope in inner city neighborhoods. Most of us have no dollars to advertise and we don't have celebrity leaders pointing their friends at us. 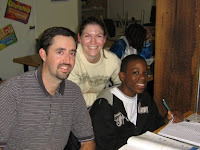 I lead the Tutor/Mentor Connection, and point to more than 200 different Chicago area organizations who offer various forms of tutoring/mentoring. You can search our database and Program Links on the T/MC web site. However, I'm a small organization in a huge city. Chicago's not the only city where there are areas of concentrated poverty, poor schools, high drop out rates. New York City is larger. So is Los Angeles. Houston, Miami, Detroit, San Diego, Boston, Philadelphia and most other major cities have the same problems. Some also have networks similar to the Tutor/Mentor Connection, working to support the actions of local programs. You can find a list of links to some of these citywide networks, as well as to national support groups, in the T/MC Library. This section even points to mentoring organizations in the UK and India where big cities face similar problems. I am trying to connect with these network, and build an on-line connection in places like our ning.com connection. If we can share what we're doing, and work together to encourage multi city corporations, alumni from Harvard, Notre Dame and other major universities, and people of faith groups that have branches in every city, we can find leaders in different places who will help us mobilize resources that don't just support one, or two programs, or programs in the headquarters city, but who search the links and support multiple networks, and multiple programs with the same type of advertising they use to draw customers to multiple locations all over the country. One person trying to make this happen is a grain of sand on the ocean floor. Many people represent a powerful force, like a sandstorm. Let's try to find a way to connect these networks, not just through national networks, but directly to each other, in on-line networks that draw resources directly to each city, and to each program in each city.